It was originally intended as a Solemn Mass for the investiture of the Archduke Rudolph, one of Beethoven's piano pupils, as the Archbishop of Olomouc. Beethoven did not complete the piece in time, however, and when he did finally finish it in 1823, it had developed into a work of art that far exceeded the liturgical requirements. With its dedication "Arising in the heart, may it return to the heart!" Beethoven's "Missa solemnis" enters entirely new territory as a musical interpretation – deeply personal, yet aspiring to general truth – of the old and venerable Mass Ordinary. The old compositional techniques, modes, and traditional rhetorical formulae, the deeply contemplative prelude with the great violin solo, and also the plea for peace introduced by military sounds in the Agnus Dei, all combine on a large scale to form a unique tableau of Beethoven’s skills and ideas. Ever since its premiere in 1824 in St. Petersburg, this work has been at home in all the concert halls of the world. With the current production of the “Missa solemnis”, BR-KLASSIK presents a premiere – just as it did with the previously released CD of Haydn’s “Creation”. 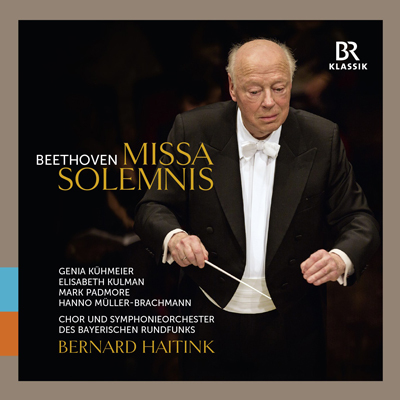 This is the first recording of Beethoven’s “Missa solemnis” under the baton of Bernard Haitink, that grand seigneur among today’s world-class conductors. His choice of orchestra for it was no accident; he has after all been connected with the Symphonieorchester des Bayerischen Rundfunks for more than 55 years now. They are joined by the Chorus of the Bayerischer Rundfunk and a finely coordinated ensemble of soloists, consisting of Genia Kühmeier, Elisabeth Kulman, Mark Padmore and Hanno Müller-Brachmann. In this recording Bernard Haitink achieves a light and youthful urgency, plumbing all the musical depths of Beethoven’s score with great wisdom of age.